Migos is an American hip hop group consisting of three members. They are Quavo, Takeoff, and Offset. The group has emerged into one of the top groups in the hip hop scene in the U.S. today. Most recently, they released Culture II in January 2018 after the massive success of their album Culture last year. This album is doing great as it reached the number one spot in the Billboard 200 chart. 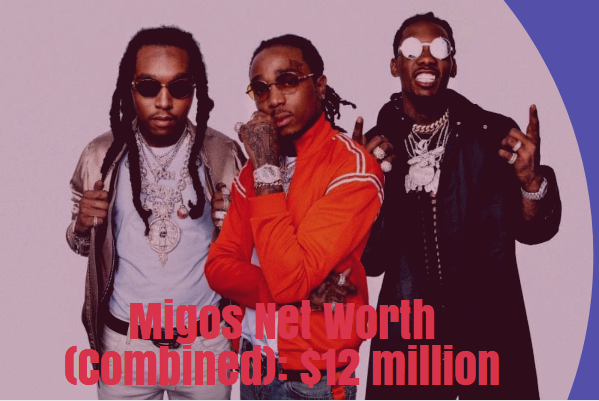 As of 2018, Migos net worth is estimated to be $12 million. The group have had amazing commercial success in the recent years and are not afraid to show it off either. Their social media posts depict the luxurious lifestyle that they have become popular for. The success of the albums Yung Rich Nation and Culture have swayed the minds of hip hop fans all across the world . They are associated with 300 Entertainment, Motown and Capitol Records through which they collaborate with artists and have created a great brand in the process. Their main source of income remains the live performances that they tend to do in large quantities. A report recently published suggested that they get paid from $20,000 to $60,000 per night depending upon the location and size of an audience. Quavo is Takeoff’s uncle while Offset is Quavo’s cousin. The reason why they are so close is because they were raised together in the same family growing up. Sometimes this fact amazes a lot of their fans but it is a chemistry that is working great today. They started off in 2009 in Lawrenceville, Georgia in 2009. The intial years were the hardest for the group as they were finding it hard to get any real tangible traction. But slowly momentum started to emerge. In 2011, they released a mixtape called Juug Season and later followed it up with “No Label” the very next year. They made a song called “Versace” in 2013. Initially, this was just another song for the Migos but later Drake noticed the song and the potential it had. He eventually made a remix of the song that helped the mainstream audience get a glimpse of their work. Soon after this success, they released a mixtape called Y.R.N. (Young Rich Niggas) which catapulted their fame even further. They took this opportunity whole heatedly to expand their fan base during this time and it has paid off handsomely for the hard work they have conducted since then. The Dab was one of the most viral trends in all of the Internet with everybody from Celebrities to Adults all the way to kids doing it. One of the earliest ones to have used the Dab officially were the Migos. They have been dubbed by many as the main inventors of the Dab and taking it to the mainstream outlet. Their song “Look At My Dab” went viral in the internet and so did the dab. After the release of the song, the trend has still not gone off and looks to be one of those rare symbols that is going to last for a long time and we have the Migos to thank them for it. The Migos make it in the headlines not only for their music but also because of some of the controversies that they have been involved in since their rise to stardom. Offset was incarcerated in 2013 because of violating his probation. In 2015, all three members were arrested after a performance they did in Georgia Southern University. This is perhaps one of their most talked about incidents. They were held for the possession of marijuana as well some other drugs, possession of firearms within a school safety area. Their possession of firearms would be the one that would result in a lengthy legal procedure as they were previously convicted felons. They even had to postpone their much anticipated Yung Rich Nation tour. The rap trio has had to pay several fines for some of the offences that they’ve conducted both as a group and individually multiple times since their breakthrough.